War spending is bankrupting America. Our nation is being preyed upon by a military industrial complex that is propped up by war profiteers, corrupt politicians and foreign governments. America has so much to offer—creativity, ingenuity, vast natural resources, a rich heritage, a beautifully diverse populace, a freedom foundation unrivaled anywhere in the world, and opportunities galore—and yet our birthright is being sold out from under us so that power-hungry politicians, greedy military contractors, and bloodthirsty war hawks can make a hefty profit at our expense. Don’t be fooled into thinking that your hard-earned tax dollars are being used for national security and urgent military needs. You know what happens to tax dollars that are left over at the end of the government’s fiscal year? Government agencies—including the Department of Defense—go on a “use it or lose it” spending spree so they can justify asking for money in the next fiscal year. We’re not talking chump change, either. We’re talking $97 billion worth of wasteful spending. According to an investigative report by Open the Government, among the items purchased during the last month of the fiscal year when government agencies go all out to get rid of these “use it or lose it” funds: Wexford Leather club chair ($9,241), china tableware ($53,004), alcohol ($308,994), golf carts ($673,471), musical equipment including pianos, tubas, and trombones ($1.7 million), lobster tail and crab ($4.6 million), iPhones and iPads ($7.7 million), and workout and recreation equipment ($9.8 million). So much for draining the swamp. Anyone who suggests that the military needs more money is either criminally clueless or equally corrupt, because the military isn’t suffering from lack of funding—it’s suffering from lack of proper oversight. Where President Trump fits into that scenario, you decide. Rest assured, however, that if Trump gets his way—to the tune of a $4.7 trillion budget that digs the nation deeper in debt to foreign creditors, adds $750 billion for the military budget, and doubles the debt growththat Trump once promised to erase—the war profiteers (and foreign banks who “own” our debt) will be raking in a fortune while America goes belly up. This is basic math, and the numbers just don’t add up. As it now stands, the U.S. government is operating in the negative on every front: it’s spending far more than what it makes (and takes from the American taxpayers) and it is borrowing heavily (from foreign governments and Social Security) to keep the government operating and keep funding its endless wars abroad. Certainly, nothing about the way the government budgets its funds puts America’s needs first. The nation’s educational system is pathetic (young people are learning nothing about their freedoms or their government). The infrastructure is antiquated and growing more outdated by the day. The health system is overpriced and inaccessible to those who need it most. The supposedly robust economy is belied by the daily reports of businesses shuttering storefronts and declaring bankruptcy. And our so-called representative government is a sham. If this is a formula for making America great again, it’s not working. The White House wants taxpayers to accept that the only way to reduce the nation’s ballooning deficit is by cutting “entitlement” programs such as Social Security and Medicare, yet the glaring economic truth is that at the end of the day, it’s the military industrial complex—and not the sick, the elderly or the poor—that is pushing America towards bankruptcy. 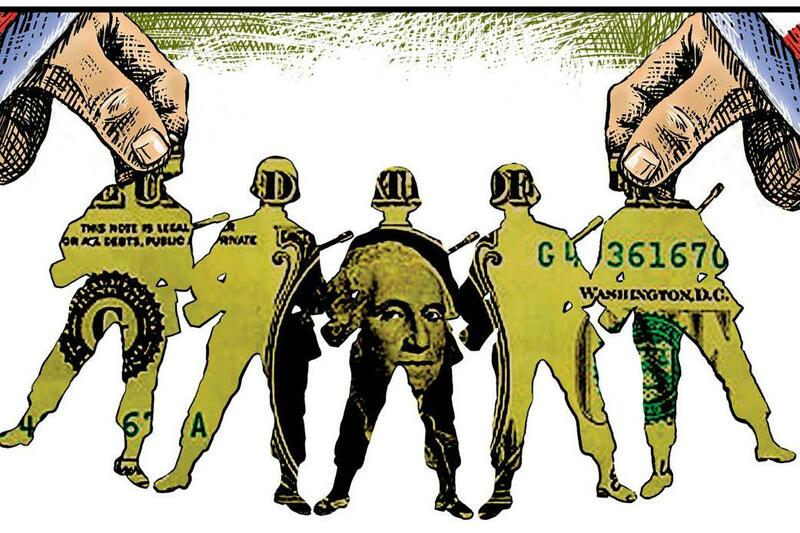 We have become a debtor nation, and the government is sinking us deeper into debt with every passing day that it allows the military industrial complex to call the shots. Simply put, the government cannot afford to maintain its over-extended military empire. To be clear, the U.S government’s defense spending is about one thing and one thing only: establishing and maintaining a global military empire. Although the U.S. constitutes only 5% of the world's population, America boasts almost 50% of the world's total military expenditure, spending more on the military than the next 19 biggest spending nations combined. In fact, the Pentagon spends more on war than all 50 states combined spend on health, education, welfare, and safety. The American military-industrial complex has erected an empire unsurpassed in history in its breadth and scope, one dedicated to conducting perpetual warfare throughout the earth. Since 2001, the U.S. government has spent more than $4.7 trillion waging its endless wars. Having been co-opted by greedy defense contractors, corrupt politicians and incompetent government officials, America’s expanding military empire is bleeding the country dry at a rate of more than $32 million per hour. In fact, the U.S. government has spent more money every five seconds in Iraq than the average American earns in a year. Then there’s the cost of maintaining and staffing the 1000-plus U.S. military bases spread around the worldand policing the globe with 1.3 million U.S. troops stationed in 177 countries (over 70% of the countries worldwide). Future wars and military exercises waged around the globe are expected to push the total bill upwards of $12 trillion by 2053. The U.S. government is spending money it doesn’t have on a military empire it can’t afford. War is not cheap, but it becomes outrageously costly when you factor in government incompetence, fraud, and greedy contractors. For decades, the DoD’s leaders and accountants have been perpetrating a gigantic, unconstitutional accounting fraud, deliberately cooking the books to mislead the Congress and drive the DoD’s budgets ever higher, regardless of military necessity. DoD has literally been making up numbers in its annual financial reports to Congress—representing trillions of dollars’ worth of seemingly nonexistent transactions—knowing that Congress would rely on those misleading reports when deciding how much money to give the DoD the following year. Unfortunately, the outlook isn’t much better for the spending that can be tracked. $71 for a metal pin that should cost just 4 cents; $644.75 for a small gear smaller than a dime that sells for $12.51: more than a 5,100 percent increase in price. $1,678.61 for another tiny part, also smaller than a dime, that could have been bought within DoD for $7.71: a 21,000 percent increase. $71.01 for a straight, thin metal pin that DoD had on hand, unused by the tens of thousands, for 4 cents: an increase of over 177,000 percent. That price gouging has become an accepted form of corruption within the American military empire is a sad statement on how little control “we the people” have over our runaway government. Mind you, this isn’t just corrupt behavior. It’s deadly, downright immoral behavior. The U.S. government is not making the world any safer. It’s making the world more dangerous. It is estimated that the U.S. military drops a bomb somewhere in the world every 12 minutes. Since 9/11, the United States government has directly contributed to the deaths of around 500,000. Every one of those deaths was paid for with taxpayer funds. The U.S. government is not making America any safer. It’s exposing American citizens to alarming levels of blowback, a CIA term referring to the unintended consequences of the U.S. government’s international activities. Chalmers Johnson, a former CIA consultant, repeatedly warned that America’s use of its military to gain power over the global economy would result in devastating blowback. Those who call the shots in the government—those who push the military industrial complex’s agenda—those who make a killing by embroiling the U.S. in foreign wars—have not heeded Johnson’s warning. The U.S. government is not making American citizens any safer. The repercussions of America’s military empire have been deadly, not only for those innocent men, women and children killed by drone strikes abroad but also those here in the United States. The 9/11 attacks were blowback. The Boston Marathon Bombing was blowback. The attempted Times Square bomber was blowback. The Fort Hood shooter, a major in the U.S. Army, was blowback. The transformation of America into a battlefield is blowback. All of this carnage is being carried out with the full support of the American people, or at least with the proxy that is our taxpayer dollars. The government is destabilizing the economy, destroying the national infrastructure through neglect and a lack of resources, and turning taxpayer dollars into blood money with its endless wars, drone strikes and mounting death tolls. As Martin Luther King Jr. recognized, under a military empire, war and its profiteering will always take precedence over the people’s basic human needs. Similarly, President Dwight Eisenhower warned us not to let the profit-driven war machine endanger our liberties or democratic processes. We failed to heed Eisenhower’s warning. The illicit merger of the armaments industry and the government that Eisenhower warned against has come to represent perhaps the greatest threat to the nation today. It’s not sustainable, of course. Eventually, inevitably, military empires fall and fail by spreading themselves too thin and spending themselves to death. It happened in Rome. It’s happening again. The America empire is already breaking down. We’re already witnessing a breakdown of society on virtually every front, and the government is ready. For years now, the government has been warning against the dangers of domestic terrorism, erecting surveillance systems to monitor its own citizens, creating classification systems to label any viewpoints that challenge the status quo as extremist, and training law enforcement agencies to equate anyone possessing anti-government views as a domestic terrorist. As long as “we the people” continue to allow the government to wage its costly, meaningless, endless wars abroad, the American homeland will continue to suffer: our roads will crumble, our bridges will fail, our schools will fall into disrepair, our drinking water will become undrinkable, our communities will destabilize, our economy will tank, crime will rise, and our freedoms will suffer. So who will save us? As I make clear in my book, Battlefield America: The War on the American People, we’d better start saving ourselves: one by one, neighbor to neighbor, through grassroots endeavors, by pushing back against the police state where it most counts—in our communities first and foremost, and by holding fast to what binds us together and not allowing politics and other manufactured nonrealities to tear us apart. Start today. Start now. Do your part.